While much of the wildlife of North Texas is slowing the pace of their activities in anticipation of the onset of winter, at Hagerman National Wildlife Refuge along Lake Texoma and Big Mineral Creek, the waterfowl are about to reach the peak of their seasonal cycle. The ducks and geese are in place or on their way in for much needed food and rest, and providing the migrating travelers a respite in the middle of their long flight south, and again in the spring for the flight north, is the foremost reason that the refuge exists. For the staff at Hagerman, preparing the 12,000-acre refuge for their visitors is a year round job. The primary crop, winter wheat, was planted in September. This grain will be the main course for the many varieties of water birds that come to the lake each season. To add variety to the menu, the refuge has agricultural areas called Moist Soil Units, where water is pumped in or drained out as necessary. Starting in June, millet is planted in these areas of levees and dikes to supplement the indigenous plants that grow there. When the plants are grown to proper levels, the fields of future duck food are flooded. Anytime is a good time to see birds at Hagerman, but from Thanksgiving through February, the flocks of ducks and geese spread out over the water in abundance. The largest numbers of water fowl are Snow Geese. These Canada tourists summer on the west side of Hudson Bay where their voracious stripping of the food sources is upsetting the delicate ecology of the tundra. Real crowd pleasers are everywhere at the Refuge. White pelicans spend September and October there, the length of their stay is dependent on the success of their fishing. 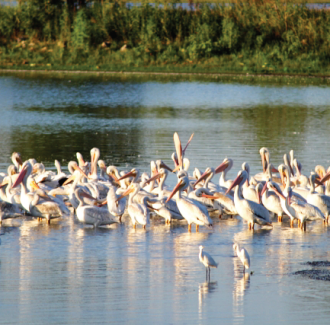 Working together in a cooperative effort, the pelicans swim in a line to herd the schools of fish toward the flock. The pelicans dip their heads to scoop dinner into their pouches and then raise their beaks as in a toast, to swallow their meal. The syncopated dance goes on until the fish have scattered. North Texas also attracts bald eagles that stay in the area during December and January. These magnificent birds come to find fish, which is why the eagles mostly are seen on the Red River below Denison Dam. Hagerman proper will attract three or four eagles for a short stay each year. Hagerman has an enviable list of resident raptors that call the refuge home year round. The Cooper’s, Swainson’s, Redtailed, and Red-shouldered Hawks are regularly spotted, as is the American Kestrel. The fall and winter seasons open up the views, not only of birds, but also of the many other animals that call Hagerman home. 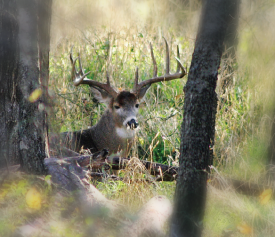 Deer, bobcats, turkeys, armadillos, raccoons, beavers, rabbits and squirrels, are much more evident in the winter. Some of these creatures can be viewed from your car, while others are best seen by visitors on a hike. There are hiking trails suitable for hikers of all abilities. Even if sightings are slim, a hiker will find curiosity piqued and will want to find out how “Dead Woman’s Pond” got its name. What really creates excitement on the refuge is the arrival of rare or never before seen birds. Recently, these have included nesting Anhingas, as well as Roseate Spoonbills, Wood Storks, and the surprise stars, a pair of exceedingly rare Whooping Cranes. Hagerman National Wildlife Refuge is a place many people intend to visit. This is a good time of year to put those good intentions into action and make use of the incredible sights of nature waiting right here in the neighborhood. The Visitor Center, with exhibits and information, is six miles west of FM 1417. The Friends of Hagerman NWR host free nature programs at the Refuge the Second Saturday of each month, at 10 am. Hagerman NWR is open year around from dawn until dusk. There is no charge for admission. Visitor Center hours are 7:30 am to 4 pm, weekdays; 9 am to Noon, Saturdays, 1 pm to 4 pm, Sundays; closed major holidays.